I had forgotten how much I love black beans. I used to make a tasty black bean and salsa soup in university. With canned black beans, it was a quick and easy meal. At that time, I tried to cook black beans from dry but it didn’t work out well. I recall hard beans in a black soup. So I hadn’t really ventured to try again. Until now. As I was reading through Viva Vegan, I was inspired to try cooking my own black beans again. I still had the 3+ year old black beans from my last adventure, so, first, I opted to buy fresh beans. Then I got to work creating this lovely black bean and portobello Brazilian-style stew. I say Brazilian-style since authentic feijoada involves lots of meat. Instead of meat, this vegan stew does not compromise in taste. It uses both portobello mushrooms and TVP (textured vegetable protein) for a meaty texture. TVP soaks up the broth nicely and like tofu, tastes like its surroundings. It is plump and juicy, and feels like ground meat. It is also probably one of the cheapest forms of protein (I bought mine at Essence of Life, and it is at Bulk Barn, but I am fairly confident you can find it in well-stocked grocery stores as well). I really liked the flavourful combination of mushrooms, black beans, cumin and thyme in the stew. A few pointers for next time, don’t start cooking the stew until your beans are at least 1.5-2 hours through their cooking time. I had a bit of a mismatch on my timing so I didn’t add them as early as I would have liked. As well, the leftover stew became thicker, so feel free to leave it more soupy, or add water to thin when reheating. I also wanted to highlight how wonderful the black beans were cooked from dry. They really were better than canned, as they held their shape, had a smooth consistency and tasted better. 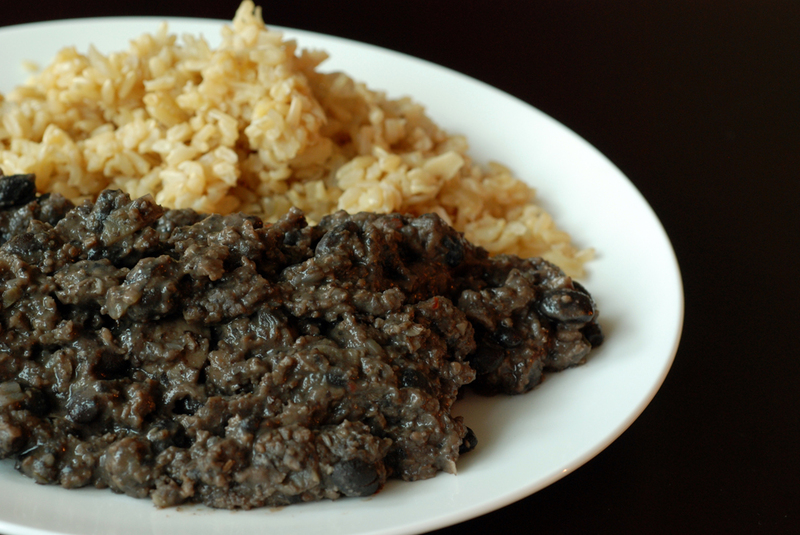 Next time, I will cook up more black beans than I need so I can make this in no time. If you don’t want to cook up your own beans, feel free to substitute 2 cans of black beans instead for a meal with considerably less prep time. This is my submission to AWED this month, featuring Brazilian food and to this month’s My Legume Love Affair, hosted by Dil Se. 1. 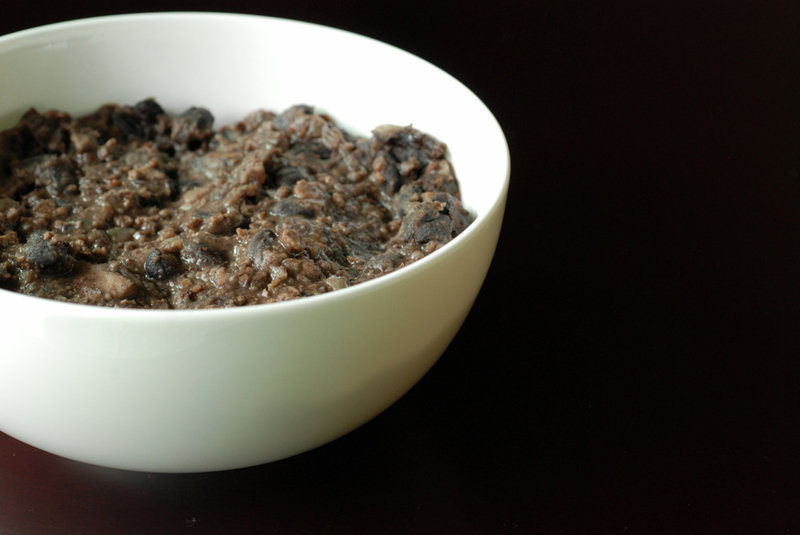 Place black beans in a large glass or plastic bowl. Cover with 4 inches of water and soak for at least 8 hours, until they have doubled in size. Drain beans and rinse. Place in a soup pot and add 5 cups cold water, salt and bay leaves. Bring to a boil over high heat, reduce to a simmer and cook for 2-2.5 hours or until beans are tender. Remove bay leaves and discard. 2. While the beans are cooking (I’d start after 1.5-2 hours of simmering), prepare the TVP and sofrito: In a mixing bowl combine the TVP and boiling water. Let the TVP soak for 15 minutes; it will double in size. When the TVP is cool enough to touch, drain it, gently squeeze out the excess liquid and set aside. 3. Meanwhile, combine the olive oil and garlic in a heavy pot. Fry the garlic over medium heat until it starts to sizzle and become fragrant, about 30 seconds. Add the diced onion and fry, stirring occasionally until the onion is translucent and tender, about 6-8 minutes. Add the wine and bring the mixture to a simmer, stirring to deglaze the pot. Stir in the mushrooms, liquid smoke, ground cumin, thyme, chilli flakes, drained TVP chunks and simmer for 10 minutes (to be honest, there wasn’t much liquid to simmer, so I basically was browning the TVP). 4. From the pot of black beans, scoop out 2 cups of beans and bean broth. Puree the beans with an immersion blender and set aside. Add the remaining beans and the rest of the bean broth to the simmering stew. Stir in the vegetable broth, then the pureed beans. Partially cover and bring feijoada to a rapid simmer, stirring occasionally. Cook feijoada until it reaches a chunky consistency but still has plenty of thick sauce, about 30-40 minutes. Season with salt and lots of pepper. Remove from heat and let sit for 15 minutes to cool slightly. 5. Serve feijoada in large but shallow bowls. Place a cup of rice on one side of the bowl and ladle the stew around the rice. Add some chopped, steamed kale and garnish with a few orange slices. This stew is great! Very filling and delicious. I want to make my own! That looks wonderful. I, too, adore black beans. And I bow down to your photographic skills. It is a very tricky subject matter that you have made look wonderful. I can’t seem to get the hang of cooking beans from scratch, which I’m sure sounds ridiculous. I find canned beans hold their shape better. When I cook them myself a lot of them end up kind of falling apart. Maybe I’m just overcooking them but I do check them frequently. Anyway, I don’t like TVP but this stew looks so good that I might have to give it another chance! Although being a pretty heavy dish, we are used to eat it on hot days at lunch – then when we’re full we have a nice ‘siesta’, usually on a hammock. Restaurants serve it on wednesdays and saturdays. Normally it is served with white rice, manioc crumbs and collard greens. And when eveyone is full, someone makes a refreshing caipirinha. I finally got around to making this. It’s great!